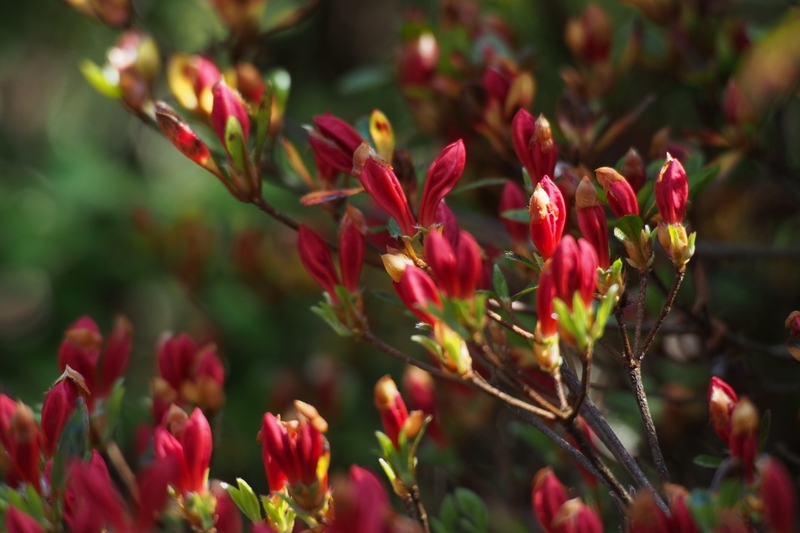 Azalea (Azalea japonica): growing, planting, caring. 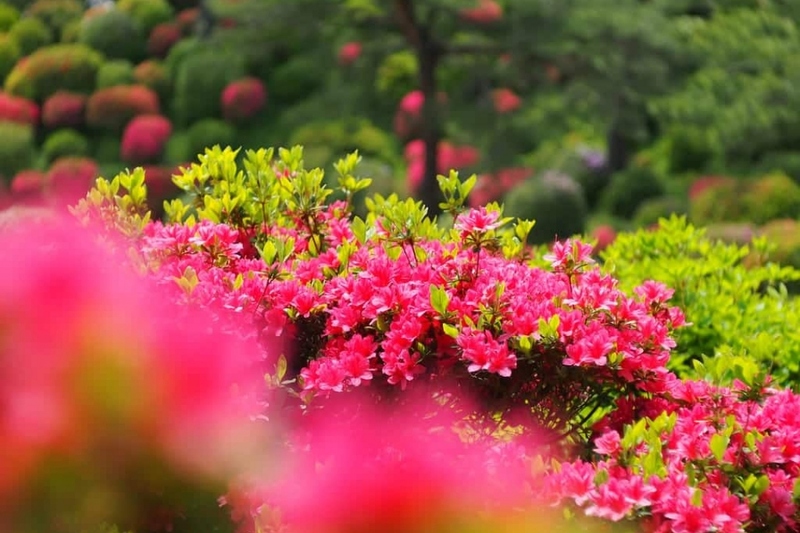 This description refers to one of the most popular outdoor types of azaleas: the evergreen azalea, a lovely shrub that fills out with flowers in the springtime. Popular in Japanese gardens, the evergreen azalea (Rhododendron obtusum) is a small bushy shrub, part of the Ericaceae family. Oval-leaved, most commonly green, though in some varieties blended with white leaves. Its persistant foliage distinguishes it from Mollis azaleas (Rhododendron mollis), which are deciduous. This azalea can reach between 1 and 2 meters in height, though no more than 50 cm in a pot. You'll rarely be disappointed by its spectacular spring blossoms, which can last for several weeks in April and May, and appear in a multitude of colors (white, pink, red, or purple) depending on the variety. Its the evergreen's cousin, the Southern Indian azalea, which is not as cold weather-resistant and therefore found indoors. The Rhododendron — or evergreen azalea — is a rounded spread out shrub that can often grow about fifteen meters high especially in the Himalayas. You can find them growing naturally in mountainous regions such as the Alps, the Pyrenees, or even in the Caucasus or Carpathian Mountains! It's an acid loving plant, but some varieties can be cultivated in neutral soils, or even slightly chalky soils — this is the case for the Rhododendron hirsutum. Its foliage is dark green, and the flowers, shaped like flared trumpets, can be pink, white, pink lilac, flecked with purple, salmon pink, or crimson. They generally flower from February until the end of July for late bloomers. 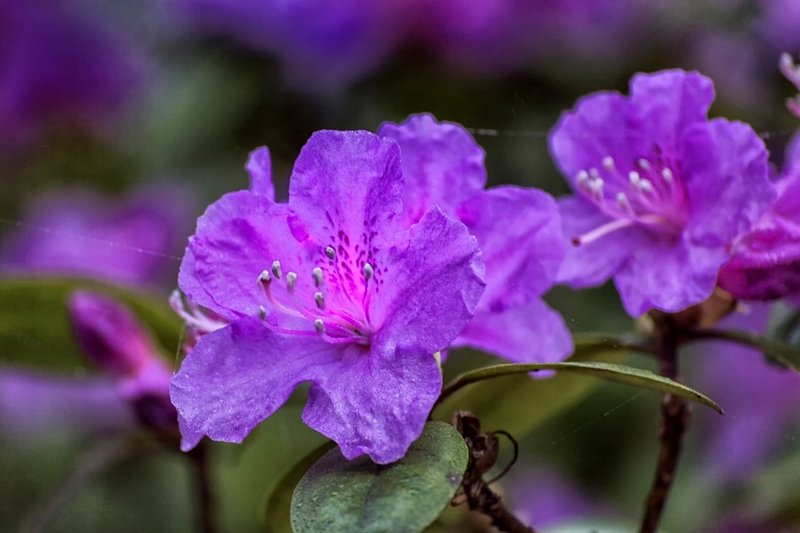 The azalea is an ericaceous plant — it loves rather acidic soils! But don't panic if your soil is rather chalky: soil enrichers, or even simply growing in a pot, enables you to benefit from this wonderful plant. Plant it in April or at the beginning of autumn. 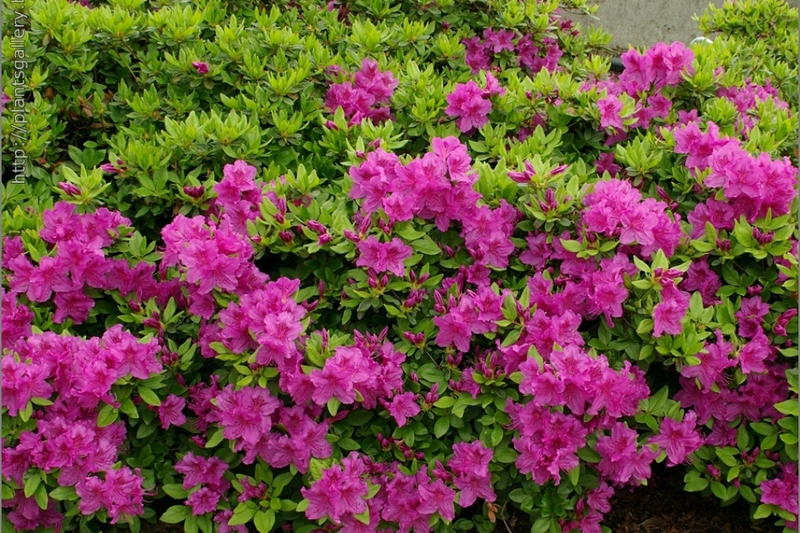 The azalea should be planted in partial shade or shade: it prefers to face a northwestern direction. Moreover, it holds up rather well against cold winters. You can plant them in groups, in solid a flowerbed, in hedges, or as a boundary. It is also happy in a pot, on a terrace, or on a balcony. Unpot the plant. Carefully disengage the roots from each other by making sure they don't cross. Put the root ball in a bucket of water to rehydrate the plant. Dig a large hole, about half a meter wide, then crumble the soil that you dug up and mix it with ericaceous compost — about 1/3 soil for 2/3 ericaceous compost. You can also add a little sand and potting soil if you happen to have any at hand. Toss a little organic fertilizer at the bottom of the hole for ericaceous plants. Place your plant in the middle of the hole while taking care to spread out the roots at the bottom. If your soil is too chalky, you can put a geotextile fabric at the bottom of the hole in order to create a sort of pit ericaceous compost. Next, fill the hole with ericaceous compost, lightly tamp the soil, and water generously. If the azalea had a favorite mulch, it would be bark and pine needles! They provide the acidity that the plant is crazy about. Otherwise, mulch with compost especially for young plants' first years. For young plants, during the first two winters and in the coldest regions, it is wise to protect them with a mulch made of wood or dead leaves. The azalea's main demand is water! The soil must stay cool, even during summer. Thus, it must be generously watered regularly with softened water. At the end of summer, you can space out the waterings. Be particularly attentive to potted azaleas: the surface dries faster, and the plant has very little reserves: a dry bout will be deadly! One thing: you should form a hollow at the base of the shrubs and then spread out a 10 cm thick layer of mulch. In the spring, water in the morning, and in the summer, in the evening after the sun has set. If you can, avoid hard water! An easy solution is to collect rain water... If in doubt, add fertilizer for heather from time to time to help solve the problem. For beautiful flowering, plan to provide fertilizer for ericaceous plants, whether planted in open soil or potted in the spring and autumn; you can also spread out a well decomposed manure in the spring at the base of the plants. In muddy and clay earth, incorporate a little sulfur to the top of the soil, while making sure not to use too much. Your azalea, if it is potted, will appreciate new soil every 3 to 4 years! Repot at the end of winter. Take the root ball out of the pot by hitting it against the edge. Set the root ball down on its side, then with a sharpened knife, cut the lower third of the root ball: the root system is fine and dense so it is easy to reduce its size. Next, remove a crown from the circumference. You will have reduced the root ball by about a half. At the bottom of the pot, place a layer of gravel for draining, and repot the plant in a mixture of soil and heath compost with a little bit of sand. Finally, tamp down and water generously. A few days later, you can do some light pruning by lightening up the center of the plant. To prolong the flowering, you can cut the withering flowers bit by bit while being careful not to touch the buds: these lead to next year's flowering! Take the time to remove dead wood and damaged or badly placed branches. To propagate azaleas, you must take cuttings! It's not easy, and the result isn't certain, but not trying is worse than failing! We suggest a branch cutting: in July, after the flowering, equip yourself with a disinfected and sharpened pruner, a sharp knife, or a grafting knife if you have one, a mix of ericaceous compost with sand added, a little rooting hormone, and some pots. In July, at the end of the flowering period, you can start to prepare your pots, which must be clean. Add a little bit of gravel to the bottom to guarantee good drainage. Fill them with the mix of ericaceous compost and river sand. Remove a semi-ripened stem cutting with the pruner. And what are they? These are the stems which show a brown part — a hard wood —and a new wood — green and soft — generally in summer. At this stage of development, the rooting of the removed stems will be better for the stems' regrowth. Remove flowers and possibly buds from the cuttings, cut the leaves at the base of the cutting. Soak it in the rooting hormone powder and create a 3 cm deep hole in each pot with a large pencil for example. Insert the cutting while taking care not to shake off the powder, and fill the hole by delicately tamping the top of the soil. Water with a spray, completely dampening the mix. Cover the cot, with the cut bottom of a plastic bottle for example. Place the pots in shade, taking care that they always have enough water all of winter: you can transplant them the following spring. Azaleas are often subject to chlorosis, which is characterized by a yellowing of the leaves from limestone. The remedy is simple: provide the soil with substances that increase the acidity! They are also fall victim to red spiders especially when the weather is hot and dry. Red spiders hate humidity: shower the foliage with water in the evenings during hot weather to get rid of them.